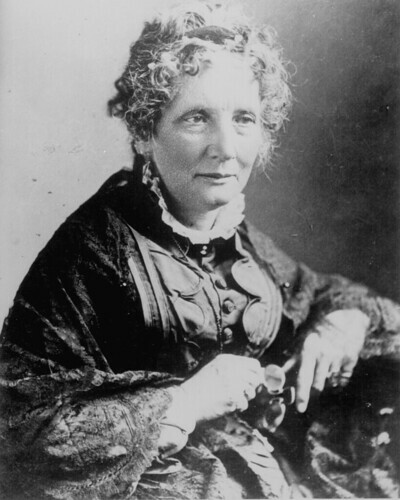 Harriet Beecher Stowe was an outspoken critic of slavery, an institution that she believed to be fundamentally incompatible with the theology of her Calvinist upbringing. An author of many works, she is justly famous for her novel Uncle Tom’s Cabin (1852), a sermonlike work that chronicled the life of a slave family in the south. In particular, it recounted the tragic consequences of slavery on families, consequences that were for Stowe to be counted as one of the worst evils of slavery. Uncle Tom’s Cabin was the bestselling book of the nineteenth century, and was influential in both America and Britain. Stowe’s book, together with her public anti-slavery work, was largely responsible for bringing the evils of slavery to light not only in America, but in Britain, Europe, even Russia. Tolstoy greatly esteemed her work and her moral courage, heaping lavish praise on her. She was renowned then, as now, for her boldness and willingness to expose the harsh realities of slavery to the public eye. The collect also strikes me as pedantic. In answer to John Robinson’s question about “how her spirituality shaped her abolitionism”: the author of the HWHM bio says that she believed the institution of slavery “to be fundamentally incompatible with the theology of her Calvinist upbringing.” As someone said elsewhere, she shared this conviction with evangelicals like Wilberforce. Both of these Christians had tremendous influence on the shaping of world-wide public opinion about slavery. In their linking of faith and action, the divide that people like Rauschenbusch sensed between personal piety and social action was crossed. With many of the additional Black Letter bios (and some current ones, too) I have the same concern – which over the year of this review I am sure I will post often. It is: I believe that bios should begin with a statement of who and why this particular person is remembered. In Harriet Beecher Stowe’s bio this sentence begins the second paragraph – and it should (IMHO) be the first sentence of the first paragraph. And, I believe that all of the bios should include a simple sentence at the end about their death (to wit): “She died in 1896”. Regarding the Collect: The phrase “who enriched her writings with the cadences of The Book of Common Prayer” sounds a bit trite don’t you think? I agree with Michael that the phrase is unnecessary and possibly in error; Stowe, like her contemporary, Mark Twain and others of their generation, were steeped in the cadences of the King James Version and their writings were reflective of that influence. If Stowe directly quoted the BCP, that’s one thing, but the “cadences” belong as much to an era of English style as to any single product of that period. As a women’s historian for more than 30 years, I find this biography lacking. Characterizing Catherine Beecher as the leader of the women’s movement against Indian Removal ignores the long-term advocacy that Catherine had for women’s education and domesticity. Her sister Harriet participated in these movements, too, and co-edited with Catherine books on housekeeping and domesticity. Stowe may have used her pen to oppose slavery, but she has a MUCH more mixed record when it comes to advancement of women. Oh, yes, and nowhere does the biography note that Stowe eventually found a spiritual home in the Episcopal Church. In the collects for Harriet Beecher Stowe both versions misspell “Harriet” with two “t”s. I’m just wondering why the Preface for Advent is used for this Commemoration in July? As I read it over I’m not seeing anything that makes me think “oh, this directly applies to Harriet Beecher Stowe”. Or am I missing some information about how the prefaces are assigned? The Advent preface was chosen because of its reference to a new and different world. One of the themes of “Uncle Tom’s Cabin” is a Christian vision that contrasts to the horrors of slavery. Line1, first paragraph: add “in Litchfield, Connecticut” after “born”.